The creative team for the new Broadway musical “Waitress.” Lorin Latarro, Sara Bareilles, Diane Paulus and Jessie Nelson are a rare all-women team in charge of a Broadway show. The first screenplay Jessie Nelson ever wrote was about a group of waitresses, a job she herself held for 10 years. But after the script was handed off to a team of men, they reworked it to make it “more and more misogynistic,” she said, and the script never made it to the screen. Two years ago, Nelson’s agent found out that the 2007 movie “Waitress” was being turned into a musical, and Nelson pitched her ideas. This time the entire process was different: When “Waitress” begins previews on Friday, it will be the first musical on Broadway to have women in all four of its top creative roles — book; music and lyrics; directing; and choreography. Nelson — best known for writing and directing the 2001 film “I Am Sam” and directing 2015’s “Love the Coopers” — is one of those four women. The others: Tony-winning director Diane Paulus, singer-songwriter Sara Bareilles and choreographer Lorin Latarro. Even though women dominated the Tony Awards last season more than at any time in the past, it has been a long time since an all-female creative team has led a musical on Broadway. Only two other musicals since 1975 have had all-female creative teams, according to Playbill Vault, an online database of Broadway shows. But those were primarily created by one or two women who did it all, from writing to directing to choreography. They were Elizabeth Swados’s “Runaways” (1978) and “Quilters” (1984), led by the two-woman team of Molly Newman and Barbara Damashek. Women in one creative role, let alone four, are still relatively rare on Broadway. Over the last 41 seasons of Broadway musicals, only about 1 in 10 directors, authors or composers, and 1 in 4 choreographers, have been female. By contrast, 255 musicals, or 52 percent, have had four men in their top creative roles. 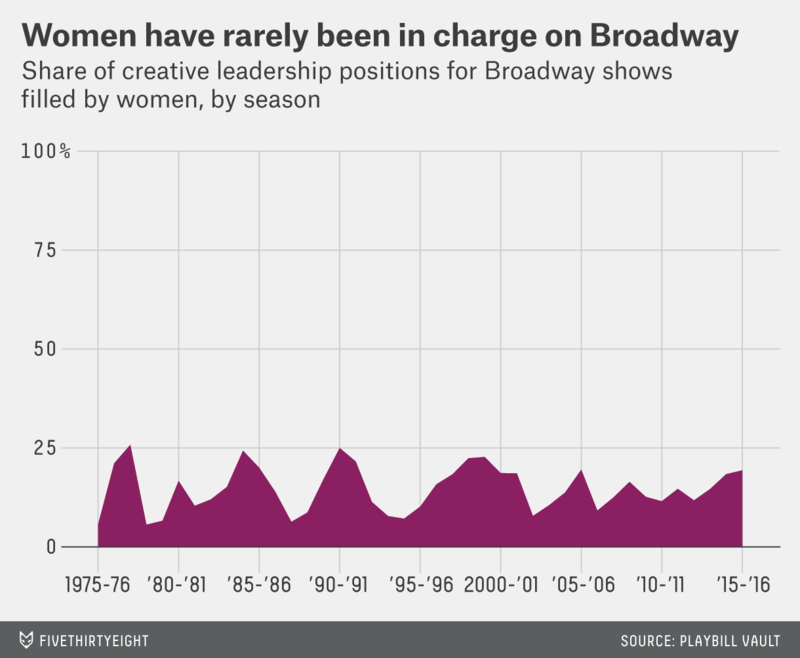 Even though there have been notable wins for women on Broadway in recent years, the overall trend hasn’t much changed. The situation is a little better in off-Broadway and other New York City theaters. According to a 2015 report by the League of Professional Theater Women, which included data on 455 productions over five years, women made up about 33 percent of directors and 31 percent of playwrights. The results look similar to a Dramatists Guild study of 2,508 regional productions around the United States: 22 percent were written by women. So, while “Waitress” may seem like a landmark, it is still quite the anomaly. For the third time in four years and the second year in a row, Paulus is the only female musical director on Broadway. Joanna Kao is a multimedia reporter with an interest in theater.